One worry that many people face is how they will maintain their electric vehicle, where will they find a mechanic that is able to work on their vehicle. Most mechanics are trained to work with internal combustion engines and you may find that they will be surprised look under the bonnet of an electric vehicle. Initially most new electric vehicles will need to be serviced by the main dealer or dealerships, many dealers selling new electric vehicle offer excellent warranties and options to extend these warranties. The main benefit and advantage is the simplicity of the electric vehicle, having far fewer moving parts there is a lot less to go wrong and a lot less to replace, and a lot less to suffer from general wear and tear. The motor contains just half a dozen moving parts, compared to hundreds of working parts for internal combustion engine, in simple terms, there is just not that much in an electric car motor that can wear out, and if it did it would be simple to replace. If you were buying an electric vehicle today chances are in five years, when your warranty runs out there will be several mechanics in your local area that have had much experience dealing with electric cars and by that time they probably will not charge too much to work on it either. Estimates show that maintaining an electric car will cost just one third of the current cost of maintaining a petrol or diesel engine car. The bottom line is that electric cars require considerably less maintenance than petrol & diesel cars. However in all this there is one important thing to consider and that is the battery. The majority of what you will find in the workings of an electric car is the battery. An array of power cells that makes an electric car run, are large, heavy and complicated. They don’t require much in the form of day-to-day maintenance but as you all know from the use of phones iPads and laptops, battery memory reduces over time. This means that the ability for the battery to hold charge decreases as the battery ages. This also means that the longer you own an electric car the range will become smaller. The memory effect will start happening from day one, however the change will be very slow and you will not notice. Most estimate guidelines believe that lithium ion electric car batteries will be good for more than one hundred thousand miles and many manufacturers give battery guarantees. However in the future we believe it will be common for electric cars to have the batteries changed as part of a service or maintenance visit. As one of the most expensive parts of an electric vehicle they can cost anywhere between £10,000 and £20,000, the good news is that as the manufacturing of lithium battery packs increases the price is coming down, and again if you are buying an electric vehicle today the price in five years’ time we significantly less, up to 50% less than the current price. 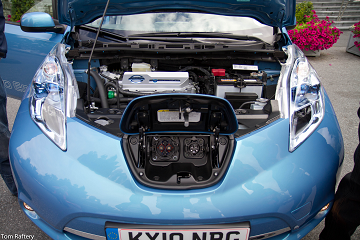 However if you are changing the battery pack of a Nissan Leaf today, this could cost you around £5,000. To overcome this many governments have pledged to ensure the price of electric car batteries is brought down in the near future. Another financial model that is being used is where the battery pack is actually leased and therefore the battery being used is constantly of a good condition, and you may even has the ability to swap battery packs on a regular basis. In the future we may find that many electric vehicles will have the same battery pack and rather than charging your vehicle if you’re out on a long journey you may pull over a service station simply swap your battery over. Ultimately the misconception of maintenance and servicing issues with electric vehicles is most definitely nothing to worry about, as there is less to go wrong and the general maintenance will cost one third of your existing combustion engine vehicle. As long as you get a good warranty from the manufacturer for your battery life, you can rest assured that you will not be out of pocket in the long term. If you are an electric car mechanic please contact us to feature in this list.